Piwik 1.8 is a major release, bringing many new features (click to see screenshots! ), resolving many bugs, including security issues. This release is rated critical. Please update now. What’s new in Piwik 1.8? In short: many amazing new features, performance improvements, many bugs fixes including security fixes. You most likely know (and probably use!) Log analyzers / Log parsing softwares such as AWStats, Webalizer, Urchin… ? You can now use Piwik to do the same, and do it better too. … at Piwik we call it simply Log Analytics 2012-style because parsing logs with Piwik is so 2012! Row Evolution allows to visualize a detailed report for a given row in any report table in Piwik. 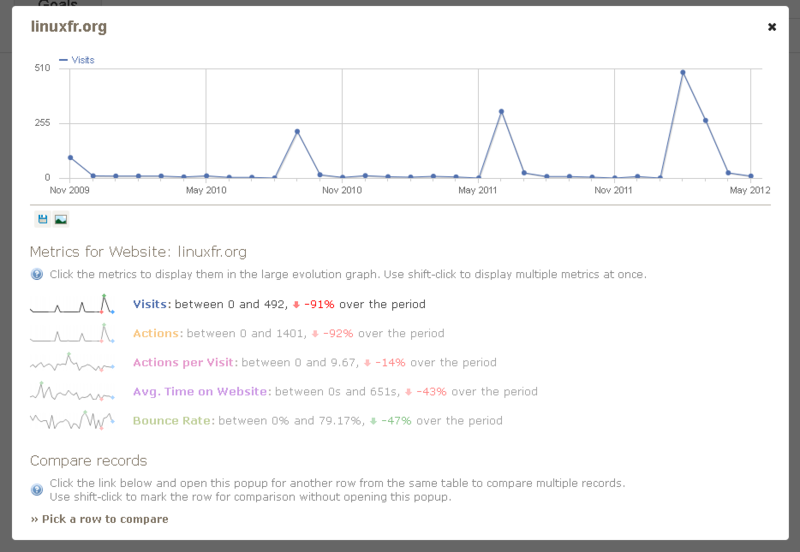 You can now hover over the row and see the graph icon. 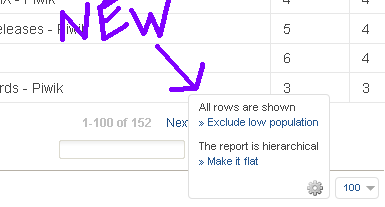 Click on it to open what we call the Row Evolution report. This report contains a graph of the last 30 days (or weeks or months etc. 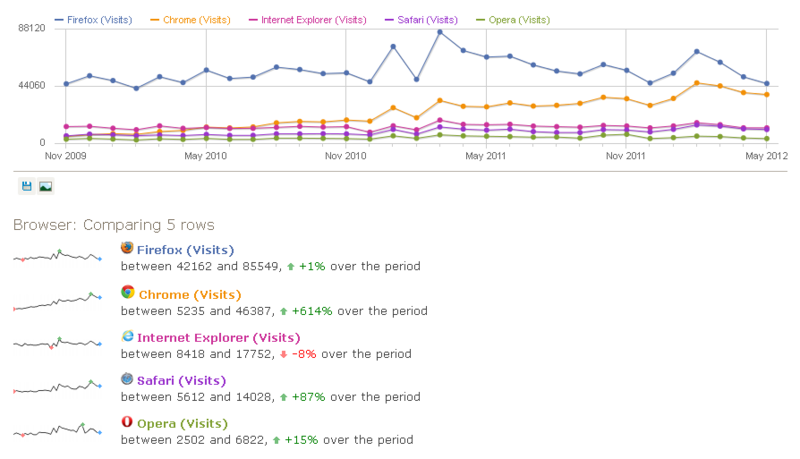 ), below the graph you will find the main metrics: visits, page views, conversions, etc. along with a sparkline and a % change over the period. It is easy to change the metric being plotted so you can easily visualize the number of visits over the last 30 weeks of a particular search engine keyword. Still you are only one click away from plotting on the graph the number of conversions for this keyword. You can even compare multiple rows together and see a graph! Note: This feature is released as BETA state – we know a few non critical bugs and we have many ideas to make the feature even easier to use and more powerful. Please submit your suggestions or bug reports in the forum. It is also possible to set the default Widgets layout used for all newly created dashboard, the rename a dashboard, remove it (delete), or reset to the default widget selection & default layout. Dashboard now automatically records & restore the full state of the widgets, including for example the columns you chose to plot on the graph. Along with the ability to customize the columns layout (change to 4 columns, or one wide and 2 small for example), it makes it easy to create exactly the dashboard you need and reuse it over and over again, customizing it along the way. Dashboard can now be embed via Iframe and token_auth and it works like a charm. We also added widgets for the Visitor Log and for the All Websites dashboard. Really quite a lot of users were eagerly waiting for these improvements making it trivial to export ANY Piwik report anywhere… as an Iframe or direct link! Ability to Flatten a report, very useful for example to see all Campaigns – Keywords combination. The Flatten feature is also very useful to obtain a Flat Page URLs report, or to compare & visualize (with Row Evolution!) Custom Variables names and values. The feature is also available via the API &flat=1 parameter. Ability to Exclude rows with low visits has been moved to this new icon. 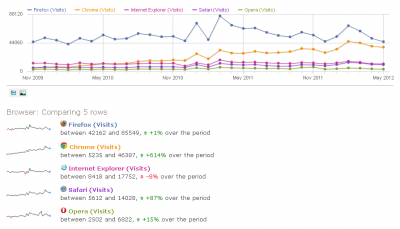 New Browser Marketshare report now reports without version names. You can access the Browser by version report by clicking on the “Related report: Browser version” link below the report. The reports Entry Page Titles and Exit Page Titles are finally available! You can access them from the “Related reports” link below “Exit Pages” report or below “Page Titles” report. The reports will contain data in the past as well, since the data was always processed but not displayed until now! All reports now display the how long ago they were generated, eg 24min 10s ago. Click on the Help icon next to the report Title to know how fresh the data is. Now possible to delete old reports! Ideal for Piwik users with a limited Mysql space, or simply to keep things under control. You can select to delete daily, weekly, yearly data, and there is a cool database estimator size that refreshes in real time to tell you how much data will Piwik use after the changes. New advanced piwik database usage report, which helps understand how the database space is used, especially useful for large Piwik servers. Check it out by enabling the DBStats plugin and clicking on the DB Usage tab. DoNotTrack support enabled by default. When users click “Tell websites I do not want to be tracked” in their web browser, Piwik will listen and not track the user. We are proud to support this privacy initiative. It is of course possible to disable the DoNotTrack support, in Settings > Privacy. The database purge will be more efficient as it now also deletes unused rows from log_action table which can be huge for some users. A particular SQL query was causing increased server load on servers with thousands of websites and more than 1M row in the piwik archive tables. A critical bug causing “0 visit days” was reported by many users, was very hard to reproduce, and has finally been fixed thanks to the help of Piwik power user Lorieri. Please report if you still experience random 0 visit days when using Piwik 1.8 and the archive.php script. All security bugs have been found and responsibly diclosed to the team, thanks to our security bug bounty program. We have partnered with one of the best PHP Security company in the world, SektionEins, who conducted a 5 days security review of the Piwik software, more than 1 year after the previous security review conducted by them. The security review by Stefan Esser highlighted a limited XSS, Cookie DOS Vulnerability, Local File Inclusion Vulnerability. We highly recommend their service for your Software security review… they are the real deal! We warmly thank all security researchers who reported Limited XSS and XSS vulns: Juho Nurminen, Mateusz Goik, Emanuel Bronshtein, and James Kettle who reported a limited CSRF. This new version does not contain major database schema changes, so the update should be quite easy even if your Piwik DB is enormous. Note that the SQL User used by Piwik to connect to the Mysql database must now require LOCK privilege. Please ensure your user has all privileges to the database including SELECT, INSERT, UPDATE, DELETE, CREATE, DROP, ALTER, LOCK. Please use the forums for support, suggestions, feedback or user stories. If you use Piwik in another language than English, how good is the translation? You can help improve the text in Piwik software. We really appreciate if you can spread the word about Piwik on your twitter, blog, website, to your friends, at conferences, etc. 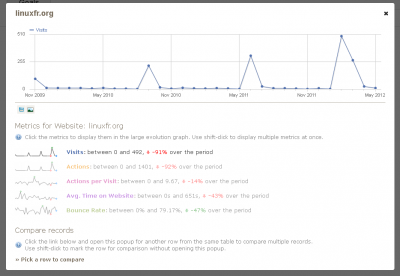 Log Analytics: Import Your Web Server Logs in Piwik! When included in an IFrame, Piwik reports do not load. How do I allow Piwik reports to load from within an iframe? After I updated Piwik, it stopped working (blank page, widgets not loading, error message, etc.). How can I fix this? When tracking visits on an intranet website, Piwik assigns all page views to a few visitors who have very high page views count. How to fix it? How do I find the visitor IP Addresses? How do I specify to use Mysql on a custom port or to connect Mysql over a socket? Widgets don’t load. I get the error message: “Fatal error: Class ‘…’ not found in … What’s wrong? How do I enable Maintenance mode (to display a maintenance message in Piwik, and disable tracking) prior to updates? How do I record tracking data in the past, and tell Piwik to re-process the past reports? When cookies are disabled by a visitor, how does it impact Piwik reports accuracy? How do I disable all cookies for a visitor? How do I select IP addresses or Visitor ID directly from the database? #534 Row Evolution: historical view of one or many specific rows in all Piwik reports! … and thank you to all translators for their ongoing work, the core Team and Partners for the bulk of the work, with some features developed by Professional Services for Piwik who are doing a fantastic jobs helping customers worldwide use Piwik effectively!